Although you still access the support pages in the same way (click on “Help” from the navigation bar), the page that opens will now look and feel different — in a way that is easier to read, navigate and search for information. On each page, there are options to drill down further into the topic, search for a specific questions in the query form or use the menu options on the left hand side of the page to find other information and resources. 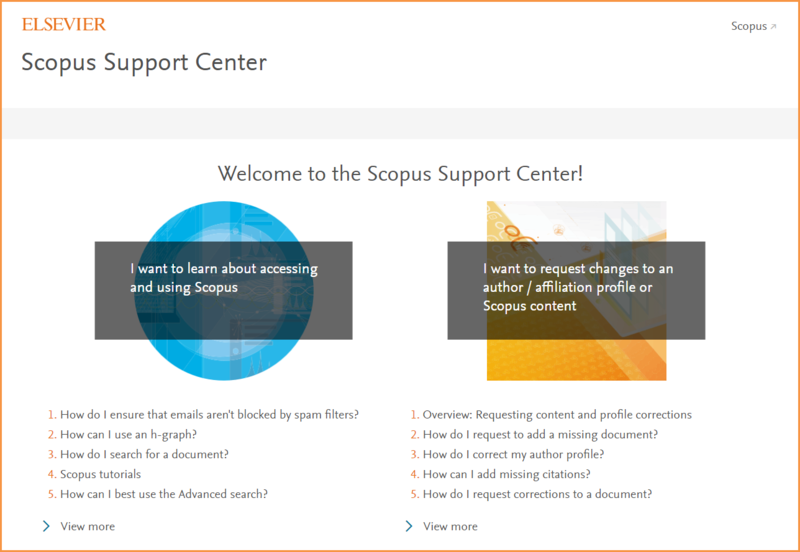 Accessing help continues to be context sensitive, meaning that when you click on “Help” while using Scopus, the Support Center will open to information relevant to the page you were viewing. When reading a help file you will see an option(s) for further assistance at the bottom of the page. When you click on Email, Chat or Callback, a form will open. There are now different forms for the “learning and accessing” and “request changes” sections. This change can help to get your query or request to the right person quicker.